Entry : open for all and the seating is on a first-come-first-serve basis. For complimentary passes please visit, Guest Reception Desk, CK Birla Hospital for Women. 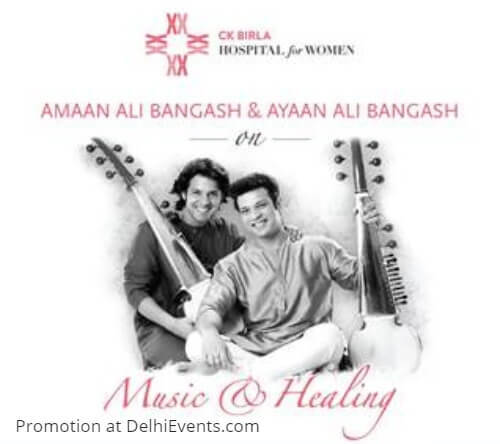 Event Description : For the first time ever, the CK Birla Hospital for Women brings to your city a chance to witness the healing power of music. The concert will be an interactive evening with Amaan Ali Bangash & Ayaan Ali Bangash (the sons of legendary Sarod Maestro Ustaad Amjad Ali Khan), who will perform and talk about the healing power of music. About The CK Birla Hospital for Women: The CK Birla Hospital for Women is a world class multi-speciality hospital committed to the care of women with state-of-the-art facilities and offering exceptional clinical care. The hospital's core clinical offerings are obstetrics & gynaecology, neonatology & paediatrics, fertility, fetal medicine, the breast centre, advanced surgical sciences (including laparoscopic, cancer, gastrointestinal, bariatric and breast surgery), orthopaedics, urology, aesthetics & plastic surgery, dermatology, internal medicine, diagnostics and physiotherapy. In addition, the hospital also offers cardiology, paediatric surgery, paediatric ophthalmology and ENT.